The painting “Autumn Landscape with Boats” was painted by V. V. Kandinsky in 1908. The artist preferred to write his creations from a living nature, but, paying more attention not to the clarity and drawing of the image, but gave more importance to color and contrast. In this picture, Kandinsky depicted the evening pier, with boats attached to it, and the shore in bright lights against the sunset, almost at night. The boats are traced more clearly, the artist depicted light and shade due to the game of neuter of different colors, combining blue, pink and yellow colors. The water has the usual blue color for the viewer, on the surface of which the lights from the shore and the outlines of the boats are reflected. The shore looks no longer clear, there are only a few silhouettes of tall trees, the mountains in the background are dark blue and the concrete slab of the pier: pink, yellow and blue. The rest of the coast is filled with yellow and red short strokes, the advanced light of burning lanterns. The sky has not the usual, even for sunset and twilight, green, blue, white and blue. In this picture, as in many others, the artist once again adheres to his theory of color. He believes that each color has its own dynamic character and has a different effect on the susceptibility of the image by the viewer. He adhered to the fact that each color is valuable in itself and its harmonious combinations can express all emotionality and convey spiritual value without the image of a real object. The artist argued that each color chord must in itself clearly express an association with the content of the mystical and musical character. 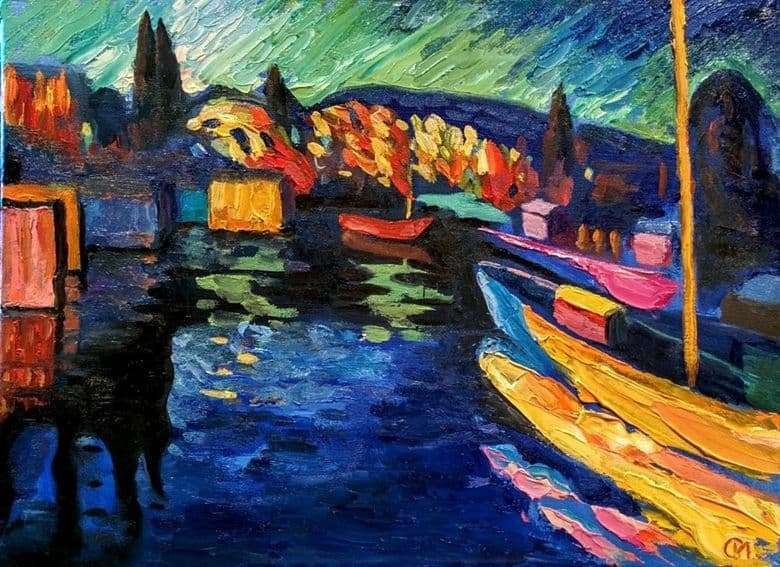 Today, the painting “Autumn landscape with boats” by Vasily Vasilievich Kandinsky is in the Merzbacher Collection in Switzerland.